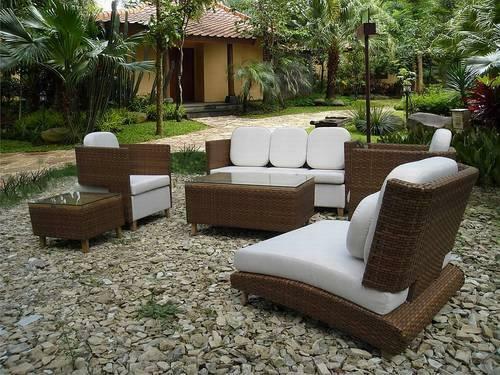 Our company is among the most sought after offering Garden Furniture to the clients. This product is manufactured by optimum grade material and latest technology under the knowledge of adroit expert professionals. Garden Furniture is praised by clients for owning remarkable characteristics. Offered range can be avail in varied specification as per need of respected clients. This product is perfect for varied residential and commercial area. Offered range is checked stringently on many quality stages before final delivery. These products are widely demanded by valuable clients. Backed with a good industry experience, we have gained immense expertise in manufacturing, trading, wholesaling, distributing, wholesaling and supplying comfortable and attractive Household and Office Furniture. Our product line comprises Lounge seating K-8001, Lounge seating K-8002, Lumbar Support, Meeting Room Chair (Debra) and Meeting Room Chair (Moore). Additionally, we specialize in offering finest array of Slim Rack, RF Modular, Office Storage Furniture (Bookcase), Magazine Rack, Wooden Rocking Chair and Stainless Steel Sofa Sets. Stringently supervised by a team of expert professionals, the entire range is precisely manufactured using high grade raw material such as stainless steel, wrought iron and wood. Supported by a team of expert professionals, we have been able to deliver an exquisite array of furniture that is at par with set industry standards. Empowered with advanced machines and equipment, we are also capable of meeting even the voluminous demands of the clients within shortest possible time-frame. Together with the efforts of our professionals and sound manufacturing facility, we are also capable of designing the range that is in exact accordance with specifications provided by the clients. All these factors have helped us in gaining huge client base across the country.